I don’t think it is an exaggeration to say that PGA Tour Golf has a depth that rivals even today’s modern golf games. 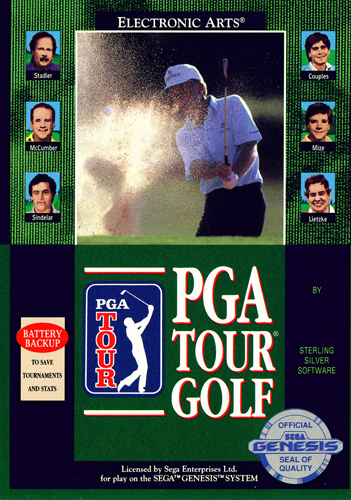 It was not only the first real golf sim on the Genesis, but the first in a long line of PGA titles from EA Sports. The game features 4 courses; TPC at Sawgrass, TPC at Avenel, PGA West Stadium, and Sterling Shores. The game also features 60 PGA tour pros that you will compete against in tournaments, but none of them are actually playable. The game uses a drop-down menu system reminiscent of a DOS-era computer game, with a generic but nicely detailed pro shop as a backdrop. You can play a practice round at any of the courses, enter a 4 round tournament, or work on your shots at the driving range and putting green. To get started, you create your own golfer, which allows you to track your career stats, including total earnings, average and best scores, and longest drive, which are all saved via battery backup. Before each hole, a pseudo-3D fly over is accompanied by one of the tour pros giving you some gameplay pointers, a feature that really makes the game feel “next-gen” when compared to 8-bit golf games. Prior to each shot, an interactive map is displayed which allows you to measure the distance from the tee to any point on the map, aiding in shot placement. PGA Tour Golf uses the standard three click system to determine power and hook/slice, and that meter displays the maximum yardage of the club being used so that you can accurately determine the power needed. The game automatically selects what it believes to be the best club for your shot, but you can change to a different club depending on your needs. Midway through your shot, the view switches to a reverse angle to show your ball arriving at its destination. The game uses a grid system to represent the contour of the green, and this is shown before every putt and chip-onto-the-green situation. This system is much more effective at realistically representing the surface of the turf than the matrix of arrows used in earlier golf titles. The controls are unforgiving which adds to the challenge, but are never frustrating as the game simply requires precise timing. PGA Tour Golf is an awesome game that is feature packed and loads of fun, and it sets the standard for all future golf sims. Tagged genesis, Golf, PGA Tour Golf, Review, sega, Sports. Bookmark the permalink.